Basanti Puja, also known as Chaitra Durga Puja, is observed during the Chaitra Navratri. Basanti Puja 2019 date is from April 11 to April 14. This puja is based on the belief that Durga Puja was originally held during Spring season, or Basant, to observe the Spring equinox. 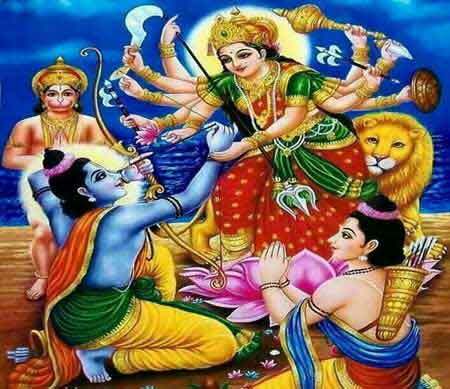 It was Lord Ram who changed worship period of Goddess Durga from Chaitra to Ashwin (October – November). He had invoked Goddess Durga in Ashwin month to get her blessings before starting his campaign against demon King Ravana in the Ramayana. The name Basanti puja is famous in eastern parts of India, especially in Bengal, Assam, Manipur, Tripura, Orissa, Arunachal Pradesh and Jharkhand. Mother Goddess is worshiped in North and Western parts of India during the same period for nine days starting from Chaitra Shukla Paksha Pratipada. This puja is still popular with Goddess Durga worshippers. Elaborate rituals are missing during the period. The rituals performed during Ashwin month Durga Puja are not performed in the Chaitra month. But people keep fast on the Ashtami and Navami day in some regions. Chaitra is the last month in a Bengali calendar. Some traditional sarvajanik puja mandals and traditional homes still conduct important pujas during the occasion. The Durga Puja in Ashwin month (October – November) is also known as Akal Bodhon, or untimely invocation, as Lord Ram had invoked her during the Ashwin month. An important puja that is observed during the period is Annapurna Puja. Basanti Puja finds mention in numerous Hindu Scriptures. It is said that King Suratha, an ideal king, was the first to worship Mother Goddess Durga. He performed the pujas and ritual in the month of Chaitra (March) during the spring season. That puja was known as Basanti Puja. People followed this pattern till Lord Ram changed it. Today, Some people perform the puja to overcome the mistakes and sins committed during the Durga Puja in Ashwin month. At the famous Malini temple, dedicated to Goddess Durga, in Arunachal Pradesh, a big fair is held during Basanti Puja. Devotees from both plain and hills offer obeisance to the goddess during the period. A big fair is held here during the period and it is known as Malini Mela.